The largest solar panel installation in the UK to date was completed during the first half of this year, helping to boost figures. 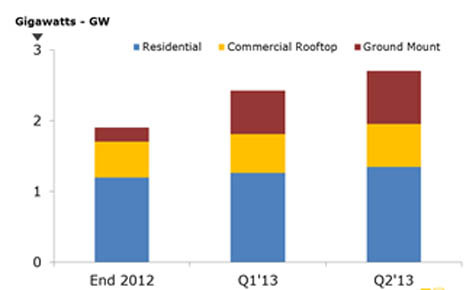 The residential sector makes up half of the UK’s cumulative solar PV installed capacity. Solar power in the UK has surpassed the gigawatt mark, taking advantage of the stagnating European market, according to analysts at Solarbuzz. Solar photovoltaics (PV), the most popular method of generating energy from the sun, in mainland Europe is facing difficulty from harsh economic conditions, as well as retroactive cuts in government incentives for renewable projects in Spain, Italy and Greece. Countries like Germany and Italy have moved towards developing energy storage facilities and updating electricity grids to accommodate the increase in renewable energy generation. Finlay Colville, vice president of Solarbuzz told RTCC that “as a result, PV is declining in mainland Europe, and the UK is seeing very strong and sustained growth”. Figures published by NPD Solarbuzz show that demand for solar in 2013 officially confirms the UK as a gigawatt-status end-market territory. Despite these positive figures, solar PV installations within the UK during April to June 2013 declined by 46% quarter-on-quarter because the ground-based solar project segment was impacted by the cut in the country’s renewables incentives on 1 April 2013. During the first six months of 2013, there were 106 new ground-based solar PV installations. Of this, 60 of the solar PV parks had an installed capacity in excess of 5MW with eight of 10MW and above. The largest solar PV installation to date in the UK was also completed during the first half of this year, the 34MW solar PV project by Lark Energy at the former RAF Wymeswold Airfield in Leicestershire. The southern regions of England (South East and South West) have dominated large-scale solar PV parks during this first quarter, with 67% of the total large-scale megawatts installed. The mid-eastern regions (East Midlands and East of England) accounted for 27%, with the remainder spread across the rest of England and Wales. The largest ground-mount PV park in Scotland was completed during Q1’13 at the former Jewel & Esk College in Dalkeith. There is currently in excess of 1.5GW of ground-mount solar parks in the UK that have gone through successful project planning application stages and are awaiting build-out or final financing go-ahead. Solar PV demand during Q1’13 in the UK is now confirmed at 520MW. Demand in the second quarter of this year was 282MW, which provided a total 802MW of installed capacity. Cumulative solar PV installed in the UK at the end of June 2013 stands at 2.71GW, with 50% residential, 22% from non-residential rooftop installations, and the remaining 28% from ground-based PV. The slowdown in the ground-mount segment in quarter two was also impacted by the availability of Chinese modules coming into Europe, prior to the European Commission ruling at the start of August. The strength of the ground-mount pipeline will ensure that the UK retains a healthy top 10 market ranking for 2013 and beyond.